Hey there! I am Kelsey from Poofy Cheeks and Christmas is my favorite holiday! I am so excited to to be here at Tatertots and Jello sharing a quick and easy tutorial for making cute little ‘naughty’ bags. I don’t know about you buy I have threatened my kids a bajillion times with the fact that Santa will be bringing coal to them this year if they are naughty. 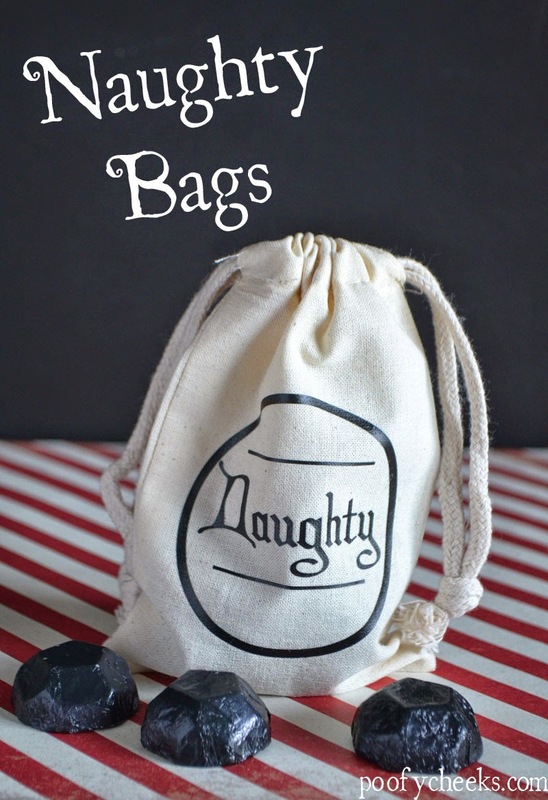 These bags will be a cute reminder in their stocking that Santa saw their naughty behavior. These cute little muslin bags would also be a cute way to give school treats or secret Santa gifts! Using the file provided and your silhouette cut the heat transfer vinyl to fit onto your muslin bags. That is all there is too it – I filled mine with chocolate coal I found in the Target dollar spot section! Merry Christmas to everyone – the Naughty and the Nice! I love this DIY Twine Art Christmas Tree! Such a fun way idea for some pretty holiday decor! And, I just love these Handmade Wood & Vinyl Ornaments. So pretty and simple! And try these Sugared Pecans for a super yummy Neighbor gift idea! Kelsey recently posted…Naughty or Nice? That is such a cute idea!! Another reason why I really want a silhouette! Coco recently posted…Wordless Wednesday Link Party!